Since it was first described in the 1760s, the basking shark has had many names: sea monster, sun-fish, even broad-headed gazer. However, as I stood at the helm of the Swilly Goose on Monday evening, I decided another was more appropriate. “They’re leprechaun sharks,” Heather joked. “Only the Irish can see them.” We had been circling close to the cliffs of Malin Head for nearly an hour, and we Americans had yet to see one. That’s not to say, however, that the basking sharks simply weren’t interested in making an appearance. In fact, they were about to make an incredible first impression. We had set out that morning full of hope: Dr. Pete Klimley (“Dr. Hammerhead”) and his wife were departing the following morning, and so far the gusty weather had prevented the formation of the tidal fronts that marked basking shark feeding territory. The water had been mixed day after day, likely shuttling zooplankton from the surface (where the sharks are often spotted) to lower ocean layers in the water column. In addition to our usual crew, we were joined today by Heather Vance, another member of the Irish Basking Shark Study Group and currently a PhD student at the University of St. Andrews in Scotland. Even by Irish standards, Heather was particularly warm and welcoming, with some impressive telemetry skills to boot. On this side of the Atlantic, students are expected to build their own transmitters to use in their research projects, and Heather was working on a particularly complex tag for her studies on marine mammal feeding behavior. Born and raised in Donegal, Heather, like Emmett, had logged numerous hours on the water and thus had a keen eye for spotting these alleged “leprechaun sharks” whenever they decided to appear. We had been on the water for more than six hours when Heather shouted: “A breach! A breach!” And a few minutes later, another from Emmett: “Did you see that one?” Then two more, naturally seen only by our Irish collaborators. Every time, I spun my head just a second too late, trying to focus simultaneously on searching and steering. A few more missed splashes later, Emmett relieved me at the helm. I jumped up, pirate-style, onto the side of the boat to gain some height, and focused solely on the horizon in front of me as if I could will the sharks to appear. Out here, any day that you see a basking shark is a good one. 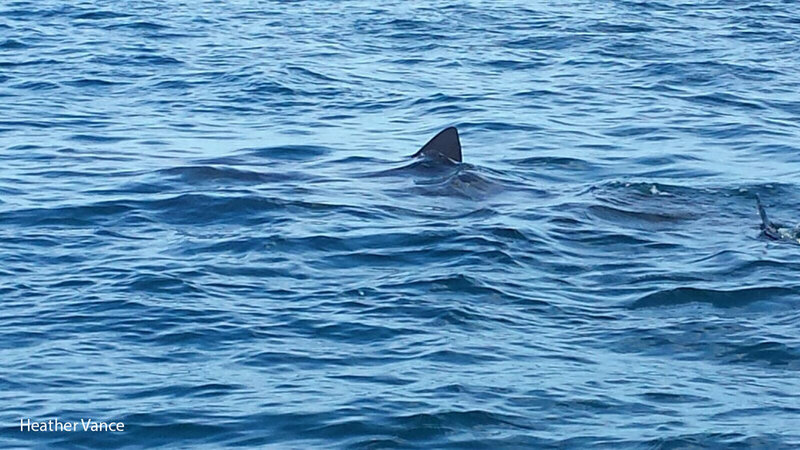 But it’s something entirely more special when you finally see your first basking shark….and it’s flying. Without warning, it leapt out of the water several kilometers away: a shape the size of a small whale with a subtle yet distinct form. Basking sharks have a funny way of breaching, as if they are flinging themselves sideways out of the water. Their noses are slightly narrow, and you’ll glimpse the tail of a fish instead of a whale’s fluke if you’re lucky enough to witness a full breach. All of a sudden, they were everywhere. Shark after shark after shark went flying through the air, some within fifty meters of our boat (which suddenly seemed quite small). Every time, I found myself too excited to form a coherent sentence, and instead settled for a yelp as I pointed. Dr. Hammerhead found this extremely funny, but I didn’t care. I was thrilled to see the animal I had traveled halfway around the world to study. After an hour and a half, the breaches slowly ceased and a light rain began to fall. We searched around for a fin or two in the hopes of attaching a tag, but to no avail. After approximately thirty total breaches, the sharks seemed to have withdrawn below the surface. It was time to head home. As I’m learning in this field season, wildlife science doesn’t have an itinerary. Data may not be available to collect within a set timeframe. It has to be enough to simply be in the environment among the animals that drive your research and inspire your passion. And while I look forward to getting to know them more personally, at least now I know: the leprechaun sharks exist.